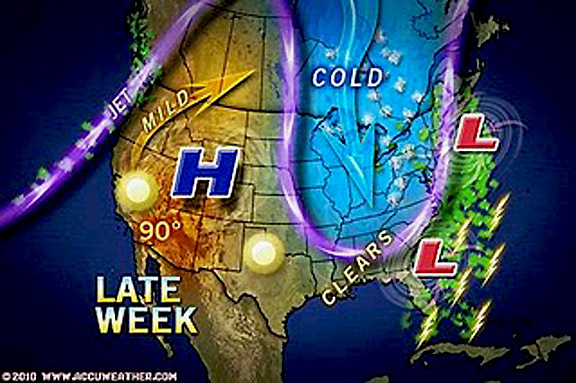 A powerful cold front was just moving off the coast east of the USA. This front had stranded passengers all over the northlands and boosted winds to hurricane force at times in the midwest. The southern tail of the system was substantially weaker but it was still pushing some squalls eastward in front of it. 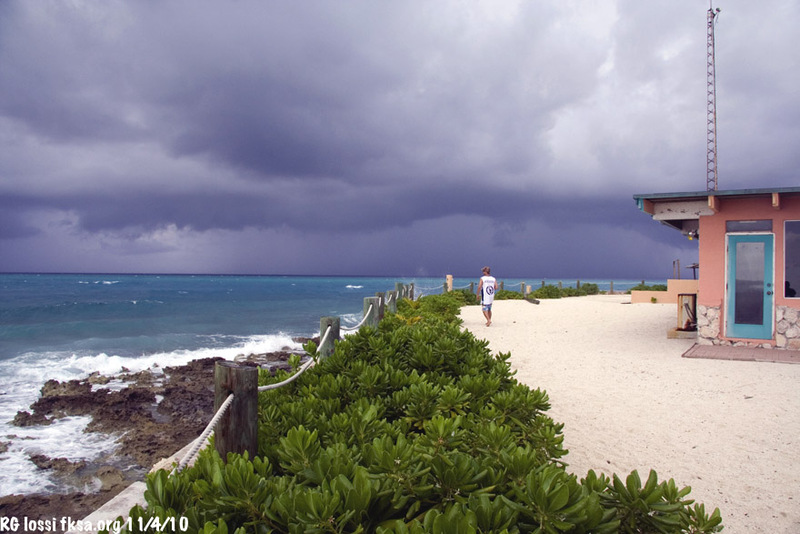 On Thursday morning, November 3, 2010 during the Pryde Group Dealer Conference on South Bimini in the Bahamas, some of those squalls came along. Around 10:45 am looking westward towards an incoming squall across the Florida Straits. Guys are out while some others are already wisely landing. You never know what these things might throw down, taking out the wind entirely, spinning the direction all over the place sometimes violently so, boosting the wind speed to 40, 50 or even well in excess of 70 kts. in bare seconds. It happens throughout the area in squalls best to take it seriously. 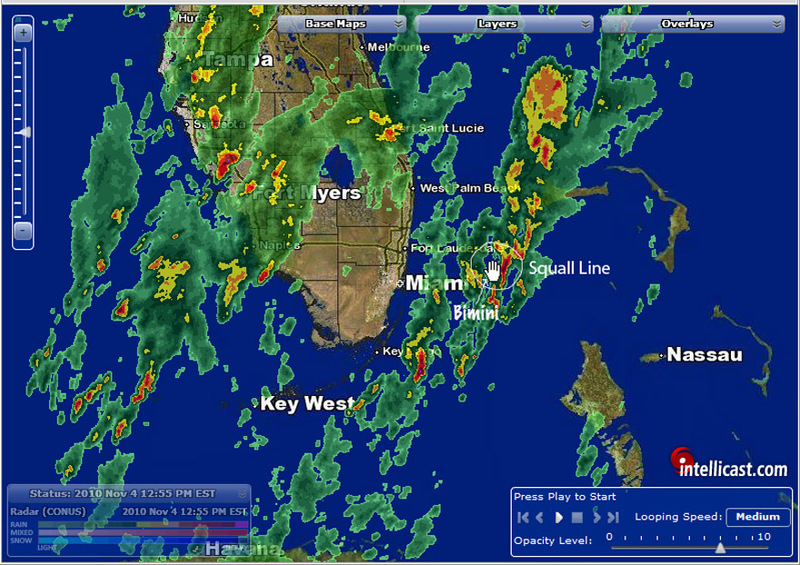 The squall line about an hour after its passage over Bimini. That red stuff and kiting typically don't mix well. 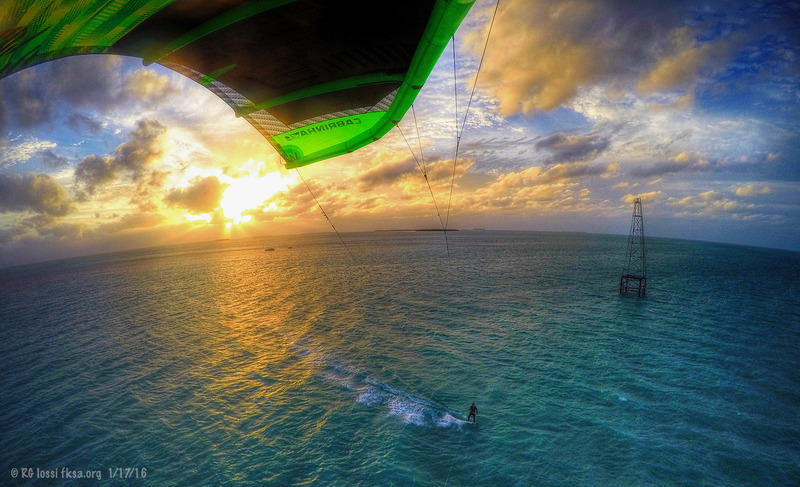 Big thanks to Tim with South Florida Kiteboarding for providing this weather image to me! Aaron Sales walks out for a better look at the dark stuff moving in fast. I put together a video of the squall bringing winds estimated to gust to around 40 to 45 kts. (about 46 to 52 mph!). There was a well experienced kiter, Devin Caroll in from the Gorge out on an 11 m 2011 Crossbow who was caught by the video camera. The remarkable thing was how stationary his kite remained during this onslaught. An 11 m kite subjected to intense winds that high particularly when parked at the zenith could still convey some power to the kite perhaps a lot. 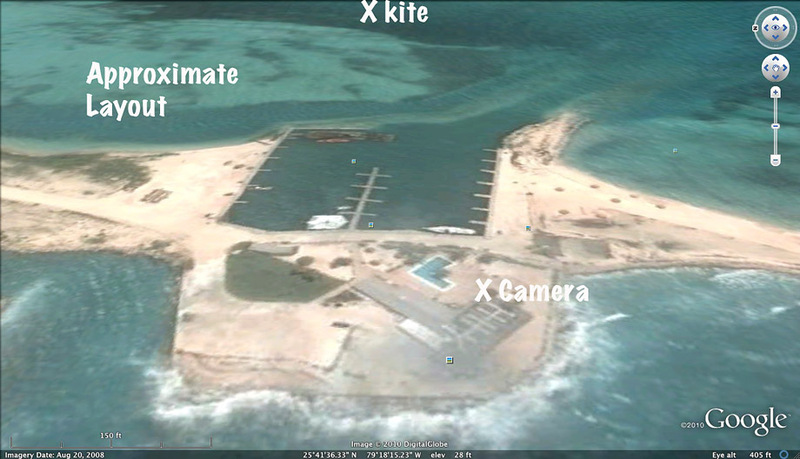 A traditional C kite would have him flying to Chub Cay well to the east. Even some flat kites could convey excess power or might spin or otherwise put the kiter in jeopardy. That didn't happen in this case. I was standing by Pete Cabrinha who offered a few comments on what we were seeing. Many kiters, several dozen have been lost in squalls over the last ten years. Perhaps hundreds worldwide have been badly injured in squalls in that time as well worldwide. The power delivered by squall gusts can come very fast, defying proper reaction. That is why it is so important to react well in advance of squall winds through careful weather monitoring and planning for each session. We're in this sport for fun, severe injury can derail the fun for a long time or simply take you out. 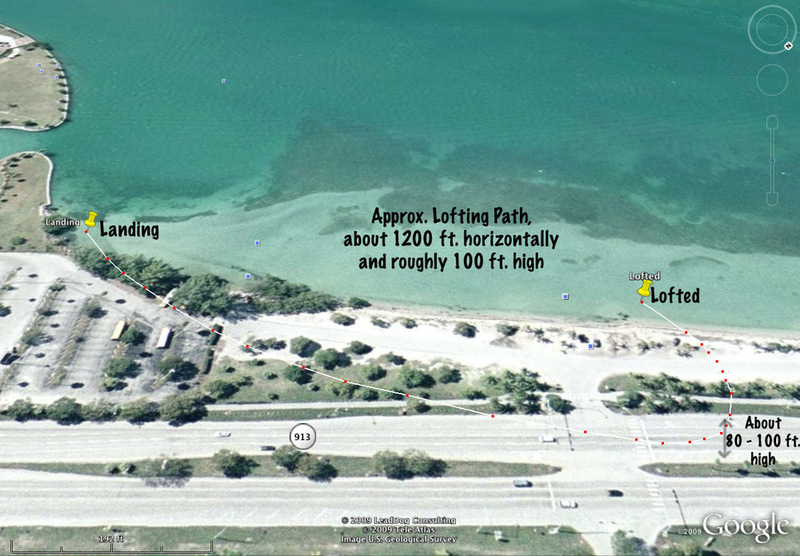 Recently kiters have been lofted over a seven story hotel, hundreds of meters into seawalls, 1200 ft. over land and back to water and historically over 1700 ft. downwind and 300 ft. off the water impacting into a mountain at high speed. We need to work to stay out of squalls and excessively windy conditions. This case might have worked out that way with a bad ending but did not this time thankfully. 2011 Cabrinha control bars are equiped with the "Recoil" spring feature. I understand it is intended to allow incremental depowering of the kite and recovery without stalling it outright. 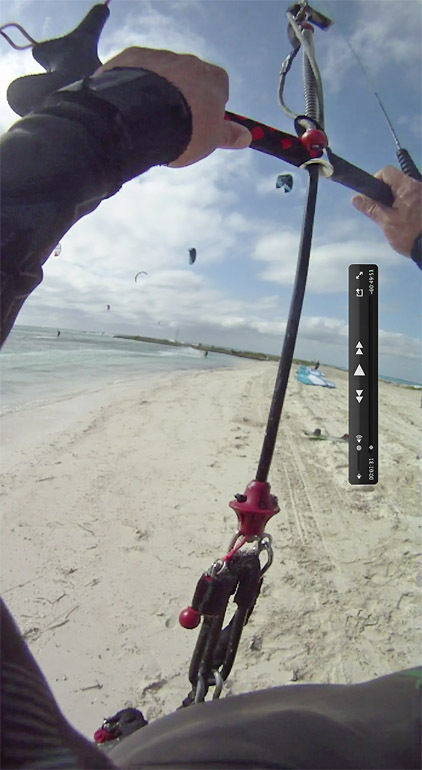 In discussing things with Cabrinha staff it may actually compress the spring under kite and rear line loading "automatically" depowering the kite as long as the bar is allowed to travel upward in wind extremes. The two above photos are screen captures of a GoPro helmet cam I had running. It captured a small "lofting" no more than a couple of feet shortly after launch. The wind was side offshore with land effects contributing to additional gusts in already gusty conditions. I was on a 9 m 2011 Crossbow and at around 190 lbs. was underpowered at times and boosted off the water (and beach once) at others. The bar is below the Recoil spring in the left photo. In the right, the back lines of the kite are pulling the bar into the bring while I am pushing it there to remove the kites power during a gust. I have included this sequence in the video clip below. Once the bar goes up, the spring is compressed and the Angle of Attack of the kite is reduced, the kite stalls and power falls off dramatically. The wind was less than 20 kts. gusting in excess of 25 kts. I would guess. I was still popped twice. If a squall happened along and boosted winds to 45 kts., IF I held the bar down I would likely be badly lofted. You can see in the video that this didn't happen to Kevin because he forced the bar up. In fact the kite pretty much stayed in place, didn't bounce or cycle threatening looping or even drift downwind much. All this in 40 to 45 kts. with an 11 m kite, real impressive. Anyway, here's the video. We really need to work to avoid squalls as the outcome is always uncertain. Wind shifts blowing you offshore, lightning strike, get brained by a large hail chunk, used gear failure, whatever. You never know. Also, not all kites will react as well as this one did, not even close. Or, if you fail to do the right thing at the right time you could well be toast. An isolated shelf cloud squall heading west the day before. Keep a weather eye out for the heavy stuff. A main message for about the last ten years is to STAY OUT OF SQUALLS, regardless of what kite you're flying. That hasn't changed. If folks conclude this is an endorsement for riding in them, look at the video and read over this account again. There is so much that can and has gone wrong. If you really screw up and end up in one, hope things work out as well for you as they did for Devin. There is no guarantee in any event, there is a wide variety of things that can go wrong, lethally so. Last edited by RickI; 04-20-2016 at 02:06 PM. Any frontal activity, is due to temperature inversions. Large squall lines not only produce wind gusts and lots of rain, but also carry a lot of energy in the form of electricity in these clouds. Look at the radar picture and lightning strikes reported in the above video. Any one who wants to sit with a 100 feet conductive line through a squall or any gusty situation, needs their head examined. Just because you don't see lightning and don't hear thunder, does not mean there is no activity. Cloud to Cloud lightning is 80% of a thunderstorm or squall line. That is why airplanes stay at least 20 miles away or more, as a lightning strike in an aircraft is a very serious condition. Don't fly a kite in electrically active weather ! Complimenting a kite capabilities should not include the windgust capabilities in these weather conditions. 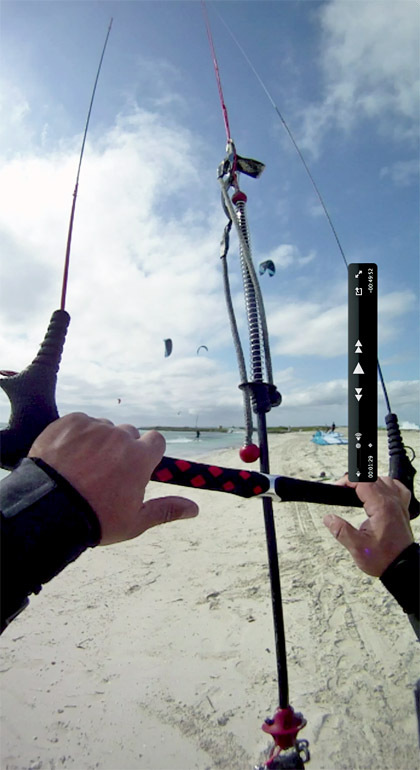 Kiters NEED to be off the water, anytime this kind of weather phenomenon is being observed. Don't ride until the last minute because it's cool and exciting. I guess we have to wait for the first kiter to get fried before sanity comes around on this subject. Clear and simple. GET OUT and OFF the water. I agree and for far more reasons beyond what you list. Squalls can create violent wind direction and speed shifts that you can't keep a kite flying in. It will stall and perhaps be relaunched spinning out of control, what then? Offshore windshifts are common and killed kiters in the past. Depower is great but can only do so much in sustained wind. Squalls aren't that well behaved, believe it. You're a professional commercial jet pilot, what are some of the reasons you don't fly through squalls aside from electrical considerations? Back to the video, what you saw happened strange as it was. The rider shouldn't have been there but was anyway. He isn't alone, lots of kiters find themselves in squalls, by accident, indifference or lack of appreciation for the teeth of the things. I sure as hell recommend against it, always, but folks will fall into it anyway by intent or accident at times. Transitioning from kite low to the water to the zenith in stronger than gale force winds would be expected to send you flying. It is dangerous in short. The conventional wisdom is to keep your kite low, at the edge of the window and be ready to send the lot free if you screw up and are caught in a squall. Activating the IDS comes to mind again early. Parking it at the zenith usually would be expected to be a formula for a bad lofting but wasn't in this case, why not? Lots of questions worth discussing instead of flaming as in the other forum. I would expect different kites to potentially behave differently too. As Kent said a CB I might invert, I had one do that years back, pulled a corner out of the kite and bent a solid carbon bar (in clear gusty weather). Here's another case, involving a 16 m BOW kite in a fairly weak squall, only gusted to about 30 mph. Lots of guys have been injured in killed in gusts of that speed, even lower so don't be deceived. Anyway, it struck him so fast, didn't push the bar out or Emergency Depower before the squall hit unfortunately, that he was climbing and well up before he really knew what happened. With a strong upward component varying the angle of attack of the kite doesn't do much at all. He kept going up. Hanging out in squalls is a fools game, bad things will happen that skill and even great kite technology can't deal with. More than that we just screw up at times and fail to do the right thing. So, stay out of them. In many aspects all unknown bring inherently many dangers. But here are many things we do know about these weather phenomenons. The structural load of aircraft is limited and in thunderstorms and squalls these are far exceeded from certification numbers. No kite is every test flown by any company and said to be o.k. in those conditions. No kite company would dare take that liability. All certification of aircraft loads are static testing until it breaks. On the GROUND ! Only the dead pilots are the tribute of showing they went one storm to deep. And I know of a few that just made a bad decision. RADAR is the eyes for the pilots in those clouds. Many times a picture drawn on a screen is not even a great reproduction of what is happening in front of you, and that picture may rapidly change in the next two minutes. And your escape plan just went out the window and your in for a ride of your lifetime, with the only thought, how you would ever come out alive and NEVER will do it again. Are kiters good at (bottom) cloud reading and speculate what is above? CB, wind pattern shifts, hail, lighting ?? Many I have seen caught in windshifts and rainstorms because they wanted one more tack to go out. And the simple why is it necessary to be this close to something that can change so rapidly. Calculated risk is made with most sports, but here is a variable most others stay away from. A few years ago, I copied from the FAA an acronym: IM SAFE and it was posted on different BB's. I Illness - Do I have an illness or any symptoms of an illness? M Medication	- Have I been taking prescription or over-the-counter drugs? S Stress - Am I under psychological pressure from the job? Worried about financial matters, health problems or family discord? A Alcohol - Have I been drinking within eight hours or less ? F Fatigue - Am I tired and not adequately rested? E Eating - Am I adequately nourished? riding in unsafe conditions and unsafe locations and unsafe equipment only make this worse. Even that someone who flew into my building may have compromised one of these rules. So I hate to read about kite accidents, my most beloved sport. Everyday I can wait for wind, but that day will be over when I handicap myself out of this world. Lots of good points thanks for posting them! Did you ever hear the story of the 35 or so Luftwaffe sailplane pilots who were tasked to evaluate storm clouds in the 1930's. They actually intentionally flew into Cumulonimbus clouds to try to evaluate the conditions. Amazingly, I think two pilots actually survived, though I am not sure how. The winds and conditions inside these monsters can pale what happens outside, 120 mph winds straight up, hail, perpetual white out, not a nice place for humans. Heard stories of hang gliders getting sucked into CB clouds and spat out on the landscape miles away, expired and iced over in a fetal ball. They couldn't dive fast enough to escape the clouds in some cases before they were vacuumed up into hypoxic conditions above 12,000 ft..
Good rule, "Im Safe." If it doesn't feel right or if you aren't feeling stoked about the session blow it off. It may blow you away otherwise. You are right, these things have factored in some accidents. Isn't another part of the avoidance of powered flight into CB or storm clouds is the unstable flight characteristics, tendency to stall, be blown into loops or other erratic flight? I recall something like this from ground school but that was about 17 years ago. If so, I think it relates well to kiting. If a 747 isn't rated to fly through the influence of one of these storms, where the hell do we get off thinking we can handle it with a passive kite and body weight? Some commercial pilots have been killed kiting in squalls which frankly amazes me. We need to take weather seriously, it can still take you out whether you think about it or not. Last edited by RickI; 11-30-2010 at 09:45 PM.